This walk: 2012-4-18. Early clay sett bound stones, Blackaton or Roman's Cross, Emmet's Post, cairn, barrow, china clay scenery, Luxton Tor, Trowlesworthy Farm and tors, Hen Tor, Shaugh Bridge china clay drying works, River Meavy, River Plym. A previous walk started from here on 2 March 2010 going in a different direction but getting different views of some of the same tors etc..
More photographs were taken when this walk was repeated on 17th May 2012. LM (Lee Moor) 1835 on the other side. Blackaton Cross, also known as Roman's Cross, showing Trowlesworthy Tors in the background. Mr Phillips of Lee Moor House re-erected this cross around 1877 using a window sill as the shaft. The socket stone and head were original. "Roman Cross" may be a corruption of St Ruman, the saint to whom Tavistock Abbey was dedicated (along with St. Mary). It marked a turn-off point on the Tavistock-Cornwood track for Plympton. The socket stone, a natural boulder, unusual in that these are often below ground level. Another view, carefully taken so as not to show the road which is immediately in front of it! Emmets Post at SX 56830 63233. This is another boundary stone (see later photographs) that was erected on a prehistoric cairn, barrow or tumulus. Emmet is an old Shaugh family name e.g an Amy Emmet was baptised at Shaugh Church on 3rd June 1790. Emmets Post bearing "SM" but no date. Brewer (page 232) states that it is similarly lettered as other posts but is undated. According to the Dartmoor Crosses web site, on the page for Blackaton Cross: "This is a worked piece of granite, about 3 feet (0.91 metres) tall and showing all the signs of having been split by the tare and feather method. This is a boundary marker, set up to show the limits of the lands formerly held by Lord Morley and Sir Massey Lopes." A look over the clay works fence. A corner of the moorland as yet unincorporated into the clay works. This view gives an impression of a clay works road - click the image to see a larger version. I was a little late in capturing this lorry with its lights reflecting in the water on the track it was travelling on. Lee Moor China Clay Works (on the map), with Wotterwaste China Clay Works (disused) to the west, Cholwichtown China Clay Works to the west, Shaugh Lake China Clay Works to the north-west and Whitehill Yeo China Clay Works to the north-east. Sibelco was formerly WBB Minerals (Watts, Blake & Bearne). Prior to that was it a part of ECC - English China Clays, based in St Austell and once part of the FTSE 100 index, who were merged with rivals in 1932 to form ECLP - English China Clays Lovering & Pochard. In 1956, the Lovering and Pochard families were bought out and the company became ECC International Ltd. Kaolin (Chinese for white mountain) and ball clay are now produced by the Sibelco and Imerys companies. Gallant Strollers at Emmet's Post. Another view of Emmet's Post showing the collapsed barrow. LM - Lee Moor. It was difficult to see SM on the other side, assuming it was there (as intimated by Brewer, see above). Standing near the junction of three china clay roads. Kaolinite is a clay mineral, part of the group of industrial minerals, with the chemical composition Al2Si2O5(OH)4. It is a layered silicate mineral, with one tetrahedral sheet linked through oxygenatoms to one octahedral sheet of alumina octahedra. Rocks that are rich in kaolinite are known as kaolin or china clay. The name is derived from Kaoling (Chinese: 高岭/高嶺; pinyin: Gaoling), a village near Jingdezhen, Jiangxi province, China. Looking along one of the clay roads. Believed Heath Milkwort, Polygala serpyllifolia, (leaves are opposite at base of stem, likes wet, acid ground = Dartmoor!). Otherwise, Common Milkwort, Polygala vulgaris, (the leaves are not opposite, likes dry neutral ground). A drainage ditch crossed during the walk. Time for a caption competition? In case you don't see one notice, try the other! The right-hand sign appears to be one way only, confusing? Setting off to Luxton Tor. Zoomed view to Trowlseworthy Warren Farm with Legis Tor behind and Gutter Tor on the skyline (right). Another zoomed view to Little Trowlesworthy Tor (left), Hen Tor and Great Trowlesworthy Tor. Nearby trig. point at SX 55887 63210 (on Memory Map), elevation 303 metres (994 feet). The adjacent hill top; this was once a large cairn of stones, now dispersed. River Plym in spate after a night's rain during a an officially declared drought that week! Note the small stick in the river in front of the small waterfall that is zoomed in on? A panning view of the River Meavy (seen first, on the left), looking around the point of confluence with the River Plym, looking down the confluenced rivers (as the River Plym) going under the old road bridge, continuing to pan left to look up the River Plym - quite dramatic! Looking at the confluence of the River Meavy (left) and the River Plym (right) from Shaugh Prior road bridge. Click on the image to see a larger version. Looking downstream from the road bridge, now it is just the River Plym. 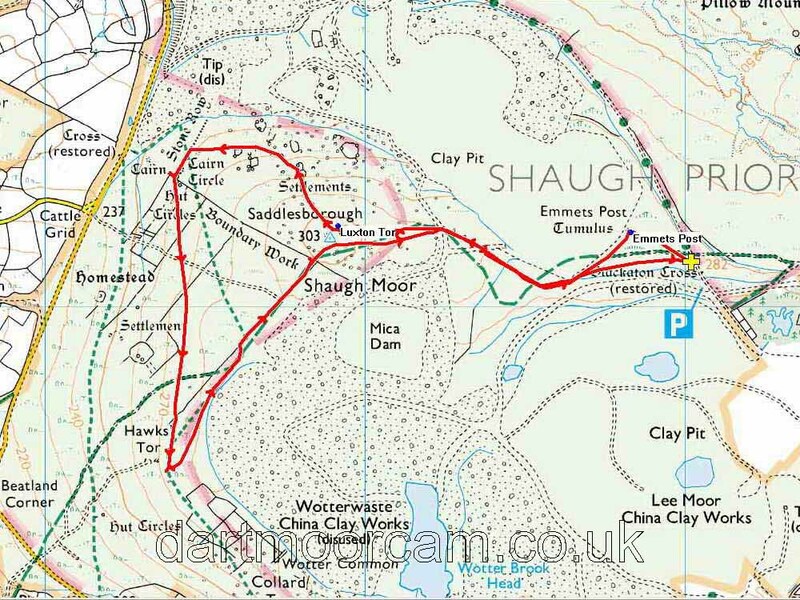 This walk was accessed from the turn-off at Cadover Bridge (SX 5555 6461), reaching the car park at the end of the road marked by the green dots. The car park ismarked by the yellow cross.